Have you tried flavored butter before? 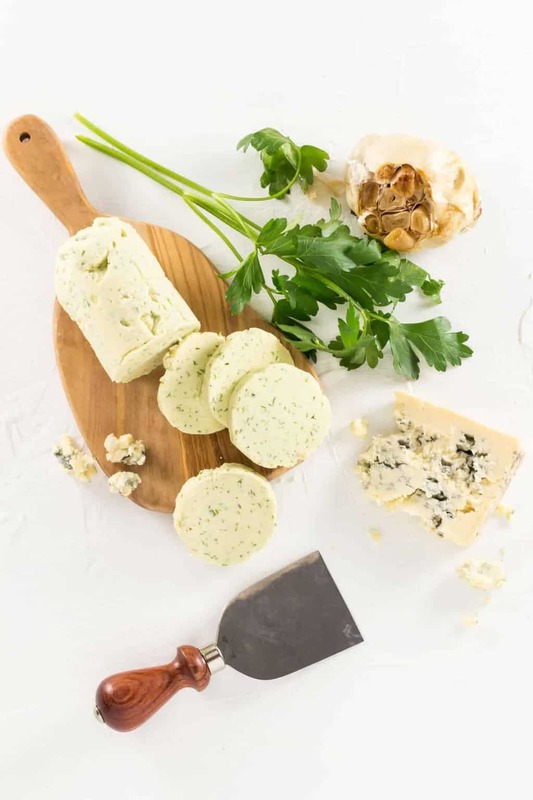 This Cashel Blue Cheese Butter is so versatile it can be used as an appetizer or slathered on top of a steak. But don’t stop there; the sky is the limit with this easy spread! Hey, blue cheese fans, this Cashel Blue Cheese Butter recipe is just for you and needs to happen in your kitchen ASAP! 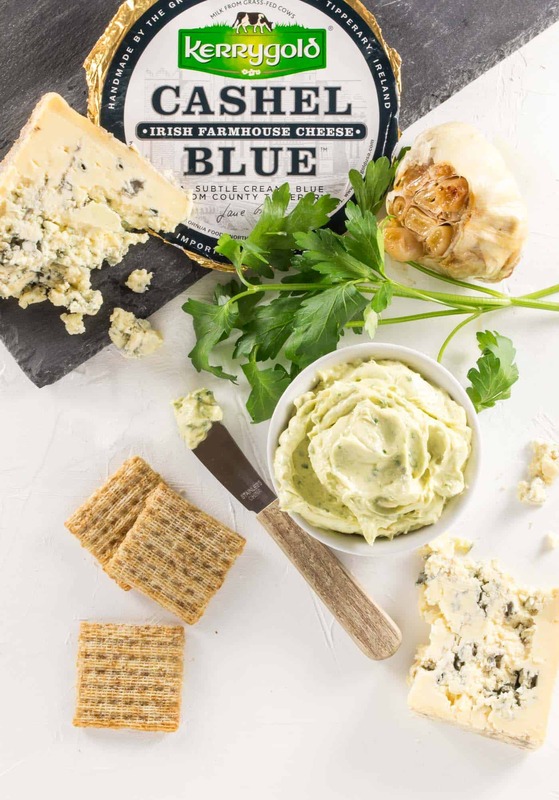 Not only does it have our favorite Kerrygold Unsalted Butter, but it also has a generous hunk of their Cashel Blue Farmhouse Cheese which is robust, creamy and absolutely delicious. Fair warning – this Cashel Blue Cheese Butter needs to be prepared ahead of time. You’ll need an hour to roast the garlic and 30 minutes for the butter to set in the freezer. But one taste and you will know it is worth every single minute. The key to getting this flavored butter smooth and creamy is letting the butter and blue cheese come to room temperature before you give it a whirl in the food processor. Add some roasted garlic and fresh parsley and you have just created a mouthwatering flavored butter that tastes amazing slathered on a cracker, tossed with fresh pasta or melted on top of a thick and juicy grilled steak. Something that easy and versatile definitely needs to be added to the must make list. Tip: Have you ever roasted garlic before? It’s super simple! When garlic roasts, it mellows in flavor, so stir any extra roasted garlic into mashed potatoes or spread it on a slice of baguette with some brie. Slice the top off the head of garlic and drizzle with olive oil. Wrap tightly in aluminum foil and roast for one hour or until garlic is soft. Remove from oven and cool. Squeeze 4 roasted garlic cloves from the skin and place in the bowl of a food processor. Add the softened butter, blue cheese and parsley and pulse until smooth. Season to taste with salt and pepper. Place whipped butter in air tight container and refrigerate until ready to use. Let the butter soften before serving. Place butter on piece of plastic wrap and from into log. Twist ends of plastic wrap like a candy wrapper to get round log. Wrap in foil and freeze until set. Slice into 1/4 inch discs and serve over steak or chicken. Disclaimer: This post was sponsored by Kerrygold. All opinions are our own. Thanks for supporting the brands that we love and that make Garnish with Lemon possible. Here is some more blue cheese love!